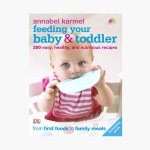 DK Feeding Your Baby and Toddler Book | Multicolour | This book helps to feed your children well - with more than 200 recipes. Feeding your child will no longer be an issue when you use this handbook. DK Feeding Your Baby and Toddler have over 200 recipes that are specifically created to wean babies from soft foods onto solid food. Feature 2 : Specifically created to wean babies from soft foods onto solid. Feature 1 : This book helps to feed your children well - with more than 200 recipes.